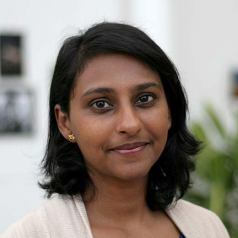 Suchismita Chandran, Ph.D. is currently working as a staff scientist at the J. Craig Venter Institute (JCVI), Rockville, MD, in the Synthetic Biology and Bioenergy Department, where she was a post-doctoral fellow for almost 4 years. She has been working on an NSF-funded project towards developing an effective vaccine for contagious bovine pleuropneumonia (CBPP) in cattle using synthetic biology technology. CBPP is caused by genetically intractable bacteria, Mycoplasma mycoides subspecies mycoides (Mmm) that result in economic havoc to Africa communities, and affect nutrition and livelihoods. To that end, Dr. Chandran has been involved in several aspects to expand genetic tools for Mycoplasmas, develop model organisms, and in the rationale design of live attenuated vaccines. Prior to her appointment at JCVI, Dr. Chandran was a post-doctoral fellow at the National Institutes of Health, working on muscle development and metabolism in mice. She received her Ph.D. from the Johns Hopkins University School of Medicine, where she worked on non-vesicular ceramide transport and sphingomyelin synthesis in the mammalian Golgi apparatus. Dr. Chandran is trained in biochemistry, molecular biology, and cellular biology including confocal microscopy. Develop and expand synthetic biology tools for genetically intractable organisms, including mycoplasma. Generate rationally-designed attenuated bacterial vaccine strains. Identify and characterize virulence pathways, and antigenicity factors. Dr. Chandran is passionate about science education, and has participated in several outreach programs, including programs tailored for middle and high school students, and college students. She has been a teaching assistant for several under-graduate laboratory courses as well as first-year medical students. Dr. Chandran has also designed and mentored several undergraduate research projects. She has been involved in various aspects of JCVI’s educational programs, including the Genomics Scholars Program, and hopes to continue to encourage and motivate future youth and young scientists. TREC-IN: gene knock-in genetic tool for genomes cloned in yeast. The Biochemical journal. 2012-03-01; 442.2: 391-401. Acute perturbations in Golgi organization impact de novo sphingomyelin synthesis. Traffic (Copenhagen, Denmark). 2008-11-01; 9.11: 1894-904.